A strong U.S. construction economy, coupled with the absence of ConExpo’s triennial competition for contractors’ winter travel budgets, lifted World of Concrete to its best showing in nearly a decade. According to the organizers, the 2018 edition of the concrete and masonry industries’ annual weeklong sun-splashed spotlight attracted more than 58,220 registered visitors. These were able to see the products and services of nearly 1,670 companies spread across more than 69,437m2 of indoor and outdoor exhibition space at the Las Vegas Convention Centre. Although the show’s new and updated equipment offerings appeared in all shapes and sizes, the main topic of conversation - at least judging by the attention getting displays at many booths - was the tiniest of substances: silica dust. Small wonder, as this was the first World of Concrete since the enforcement of the new U.S. exposure control standard began last September. As a result, dust was everywhere at World of Concrete, literally and figuratively. Most exhibitors offered a solution for managing it while still providing the productivity and reliability contractors crave in order to stay competitive. The first steps into World of Concrete’s famed Silver Lot for example, brought a visitor to Bosch’s array of PRO+Guard dust collection attachments that interface equipment of all ages, and chisels of all lengths, with suitable HEPA-filter equipped vacuums. Some of the many other vacuum offerings included CS Unitec’s new updated Model CS 1445, which automatically cleans its filters without interrupting suction when decreased airflow is detected. An electro-magnetic pulse cleaning system maintains maximum suction by automatically shaking the HEPA filters to remove debris during operation. Blastrac rolled out a five model line of dust collectors, ranging from the BDC-1133, designed especially for asbestos and other hazardous materials, to the BDC-133, a three motor system available in both M and H class models. Blastrac subsidiary Diamatic introduced the BDC-122, a compact single phase HEPA dust collector for small walk behind grinders. The company also introduced two propane powered models, the BDC1115 and BDC-1110. Both feature fibreglass housing, and are powered by 656cc Briggs and Stratton engines. Makita unveiled its versatile SCV04Z vacuum that offers both corded and 18V cordless operation complete with an efficient 3 stage HEPA filtration system. In cordless operation, the SCV04Z uses two 18V 5Ah batteries to deliver up to 65 minutes of continuous run time on a low setting, and 30 minutes on high setting, with 74 CFM and 914mm water lift of suction. In corded operation, the vacuum delivers 127 CFM and 2438mm water lift. Putting water to work to control slurry was also one of the themes at Hilti’s expansive outdoor booth, where the company introduced its DD-WMS 100 water management system for any diamond wet core rig on the market. An innovative recycling system turns just over 18l of water into a full day 115.3l supply, while slurry is captured in an easily removable multi-layer filter bag for disposal. 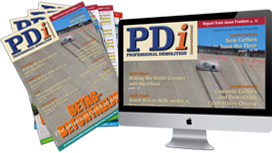 World of Concrete offered plenty of other new tools to help deal with dust, as well improve owners’ profit margins. Hilti unveiled its TE 2000-AVR demolition hammer, which provides 35.2Nm of impact energy, and 1,800 impacts per minute. Weighing in at 15kg, the TE 2000-AVR is easy to manoeuvre and transport, featuring exceptionally low vibration from its brushless SR motor. The hammer is designed for use with another new Hilti product, the TE SPX-SM pointed, self -sharpening chisel. Made from high alloy steel with a unique induction hardening process, the chisel’s innovative X-polygon wave design and tube effect combine to prevent sticking, while also optimizing dust removal. DeWalt has expanded its range of large SDS Max demolition hammers that promise 20% more power, led by the DCH733 FLEXVOLT® 60V MAX brushless combination hammer. Along with producing 13.3J of impact and 350 rev/m, the DCH733 features an innovative E-Clutch® system that increases user control in bind up and stall situations by sensing a stall during use and managing torque accordingly. Additional models in the product line include corded 47mm and 50.8mm combination hammers that achieve 13.3J and 19.4J respectively. Accompanying the new hammers are DeWalt’s SDS Max bits, designed to reduce fatigue and minimise breaking. The redesigned head geometry is bonded securely to a high alloy steel body that remains stable under high impact. Skilsaw followed up on last year’s debut of the MEDUSAW worm drive concrete saw by adding an adjustable arm, creating a 177.8mm walk behind model, the SPT79A-10. The arm extends to the user’s height and folds and locks into place for transporting and storage as a single unit. Designed for both wet and dry applications, the saw’s three point line of sight allows for accurate cuts, while a large foot and oversized wheels increase stability. Another interesting product adaptation was at the Bosch booth, which displayed a GPS tracking module retrofit that can be added to the company’s SDS-max™ hammers. Already available on the GSH27-26 Brute™ turbo breaker hammer, the device allows the tracking, location and status of equipment. Notifications of unauthorized use are immediately sent via a smart phone app. Some new products, though, could only be hinted at. At the ICS Blount booth, visitors saw a rough model of a new 536-E electric saw that the company says will make its debut in Europe this summer. The first product to be displayed with the Epiroc brand was the ER 1500 double headed transverse drum cutter, which the company says is ideal for tunnelling, special foundation work, demolition and soil mixing. An integrated dust suppression system maximises safety and helps achieve those aforementioned new OSHA silica dust regulations. Weighing 1,750kg, and fitted with 44 tungsten carbide tipped picks, the ER 1500 is suitable for carriers in the 20t to 40t class. It delivers 120 kW of power, a cutting force of 40.6-69.9kN at 350 bar, and a standard cutting head width of 880mm. 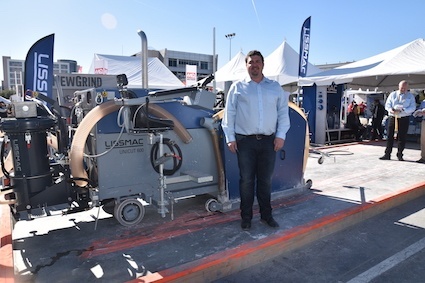 Concrete floor grinding and polishing machines seemed to enjoy a somewhat higher profile at World of Concrete 2018, with several of the market’s strongest players introducing new products. Scanmaskin hopes to hit a home run with the latest addition to its World Series line, the Scanmaskin 32. According to the company, the 800mm electric and propane models are among the most robust and technically advanced in the industry, with cast alloy components, a floating shroud, and new tool head for better balance and support. Weighing 630kg, the electric model is powered by a 15kW motor, with the 600kg propane model having a 18.5kW engine. Superabrasive launched its L20G-X, a 510mm propane grinder with an operating range of 610-1,090 rev/m. The 292kg model is equipped with a Lavina fuel minder digital control system for closed loop fuel management, and a new misting system producing 10 micron water droplets which eﬀectively suppress and remove dust particles from 0.1 to 1000 microns. NewGrind extended its Rhino series with the 800mm RXL 1000, a 1,544kg self-propelled electric machine featuring quick belt change. A biased weight system that can add up to 272kg using standard Olympic plates, and the ability to edge within 18.4mm of a wall also feature with its 279mm discs may be set from 200 to 900 rev/m. At the top end of grinding size is the Blastrac BMG–2200 ride on machine, with three powerful BMG-780PRO grinding heads. As with other large Blastrac machines, the BMG-2200’s heavy duty dust collection system is equipped with a pre-separator, an automatic pulse filter cleaning system, and Longopac bagging system. Visitors interested in the latest in larger equipment weren’t disappointed. John Deer introduced the 344L compact wheel loader capable of dealing with a 5,750kg full tipping load, and an articulated frame / rear wheel steering combo. John Deere also added three new mid frame models to its G-series skid steers and compact track loaders. With a 52-55 kW range, the three new models can load a 3m sidewall dump truck or hopper, and feature cabs with features such as ‘back-up’ cameras and heated seats. Gehl introduced its new Pilot series of hydraulic compact track loaders to the construction market. Operating capacities for the three model series range from 839 to 1,111kg at 35% tipping load, and 51 to 55.4kW. All of the machines feature seat mounted ‘pilot-operated’ joystick controls and a unique fold up front door that affords both easier operator access and a lower overall machine height of 2,100mm. The series also feature the automatic track tensioning which initiates proper track tension when the engine is started and relieves the pressure when the engine is shut off. Along with simplifying routine maintenance, this feature allows for the loader's tracks to be replaced in as little as 20 minutes. Kubota introduced two new compact excavators: the 3t KX033-4 features an optional dipper arm that can extend the machine’s reach to 787mm. The new U247-4 tight tail swing excavator takes over from the company’s popular U25S model, providing a digging depth of 2.8m and a bucket digging force of 9,509.7 Nm.